The Smart Fuse Block is the next generation of battery saving devices designed specifically for use in conversion vans. 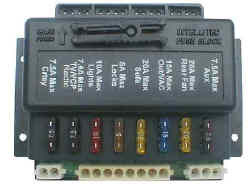 Smart Fuse Block provides the fusing for the converter added loads and time controlled outputs that turn off the lights, rear radio, and TV after you leave the van. This eliminates the major cause of a dead battery. Other battery saving devices let the battery go nearly then turn the power off. Each time this happens, critical damage is done to the battery. Smart Fuse Block turns off the power before the battery goes dead. It works on the of a dead battery, not the effect . The Smart Fuse Block knows when you are in the van and it provides power to all the loads. Ten minutes after you leave the van, the Smart Fuse Block turns off the power to the lights, rear radio and TV, preventing them from draining the battery. When you open the door, Smart Fuse Block knows you are there, and automatically turns the power back on. This lets the occupants use the lights, rear radio, and TV without the keys being in the ignition. Mom can leave the kids in the van watching TV while she goes into the store, knowing that they won't be able to start the van because she has the keys. That's not all. If the Smart Fuse Block senses that the battery is getting low, it doesn't wait ten minutes to turn off the load; it turns them off in less than two minutes. When Smart Fuse Block turns off the power, there's no "hidden" button to press. Next time you open the door, or turn on the key, it resets automatically. Lastly, Smart Fuse Blockprovides another important customer feature, an interior light delay. This keeps the courtesy lights on for up to twelve seconds after the doors are closed. It gives the occupants light to get their seat belts buckled and the key in the ignition. What if the doors are left open? Don't worry. In ten minutes, Smart Fuse Block will automatically turn off the lights to keep the battery from going dead. When you return, power will be restored by closing and opening the door, or turning on the ignition. Standby Current: Less than 3 milliamps.